Caution: This blog contains some graphic details which may not be suitable for children or individuals suffering from related post-traumatic stress. Names and details are modified to protect the confidentiality of clients. Sam was a 20 year veteran fire fighter. He had worked on over 500 scenes in which he experienced life threatening circumstances or he witnessed the death or near death of residents of his community. In one ghastly scene, Sam had to penetrate a blazing home to search for the residents trapped inside. Wearing over 70 pounds of gear, Sam entered the home through a back window and began a search of the home. He crawled around room by room with nearly zero visibility, flames all around him, and black smoke billowing. At one point, structures gave away and Sam became pinned by burning wood supports. His partner quickly freed him and Sam pressed on searching. As Sam entered a bedroom on the main floor he could hear the nightmarish scream of a teenage girl. He rushed to her side and found that she had been burned badly over the majority of her body. He carried the girl to an exit, all the while she continued screaming from the agonizing pain. Just as Sam was about to exit the home, the young girl drew silent. She had died in Sam’s arms. When Sam came to see me, he was experiencing severe anxiety and depression symptoms. He had difficulties with his anger that were straining his relationships. He also struggled with being in enclosed spaces (e.g., airplanes, tunnels, burning buildings) and this was impacting his ability to work. Viktoria had been a geriatric and palliative nurse providing end of life care to her patients for 10 years. In her role, she treated the illnesses, diseases, and ailments that were contributing to her patients deteriorating health. She prepared her patients for death and she counselled the families and friends of her passing patients. Viktoria shared that she had sat with many patients, holding their hand as they passed, hoping to provide them with one last positive moment before leaving this world. She shared that some of her patients passed away peacefully but that others experienced horrible deaths as they experienced tremendous pain or tried to fight against death. When I met Viktoria she had severe sleep disturbances which involved unending nightmares about the deaths of her patients. In a typical day, she would experience 10 to 15 unexpected and uncontrollable flashbacks to the deaths of patients. She isolated herself and she refused maintain relationships with others out of fear that she would lose them to death. A traumatic event occurs when someone is exposed to actual or threatened death, serious injury, or sexual violence. A person can experience the trauma directly to themselves or they could witness the event as it occurs to someone else. A person can also experience trauma by learning that a close family member or friend had died or experienced a life-threatening event. Additionally, trauma can be experienced by the repeated experience or extreme exposure to aversive details of traumatic events. After experiencing a traumatic event, the typical response can be varied. These responses can include an adrenalin rush, anxiety, irritability, sleep problems, depressive symptoms, hyper-vigilance, mood swings, changes in appetite, and withdrawal. In many cases of trauma, the individual requires some time and support to process the event and usually the symptoms dissipate. In some cases, the symptoms do not go away or they worsen resulting in a stress or trauma disorder. Intrusion – Intrusions refer to a re-experiencing of traumatic events. Intrusions can include the experience of distressing and uncontrollable memories or dreams, feelings that the traumatic events are reoccurring, and significant psychological or physiological distress after exposure to triggers that remind the person of the traumatic event. Avoidance – Avoidance involves keeping away from or preventing triggers from occuring that remind the person of traumatic events. This can include trying to avoid distressing memories, thoughts, or feelings related to the traumatic events. It can also include avoiding people, places, objects, situations, or activities associated with the traumatic events. Negative Alterations of Thoughts or Moods – Trauma can lead to an increased negative view of the world that causes the person to think or feel more negatively than usual. These alterations can include an inability to remember important aspects of the traumatic event, negative beliefs or expectations, distorted thoughts about the cause or consequences of the traumatic event, reduced interest in activities, feelings of detachment from others, or an inability to generate positive thoughts or emotions. Alterations in Arousal and Reactivity – Alterations in arousal and reactivity refers to changes in how one responds to the world around them. Symptoms can include irritable behaviour and angry outbursts, reckless or self-destructive behaviour, hypervigilance, exaggerated startle response, problems with concentration, and sleep difficulties. In working with many first responders, I have noticed two complicating trends that are likely to worsen the traumatic experience and symptoms for these men and women. First, there is a considerable stigma about seeking mental health support. While there is a general societal stigma about mental health, the stigma is more pronounced amongst first responders. By choosing a career path that specifically involves dealing with trauma, experiencing a stress or trauma disorder can sometimes be greeted by labelling, stereotyping, or discrimination. The second complication is that by the nature of the job, first responders are required to relive traumatic experiences. The primary reoccurrence comes from the fact that first responders are required to address the next traumatic event that occurs. In addition, first responders often have to re-enact traumatic events in order to refine job-related skills or develop new strategies. First responders can sometimes get trapped in this trauma bubble. They have to constantly experience and relive traumatic experiences while not being able to seek the help they need due to stigma. Often the support and love of family, friends, and coworkers can help an individual manage through the aftermath of a single traumatic experience. Some people are able to tackle the symptoms of ASD that might occur through that first month after a traumatic event. If symptoms persist beyond a month, it may be time to seek professional support through someone who is trained to diagnose and treat stress and trauma disorders. 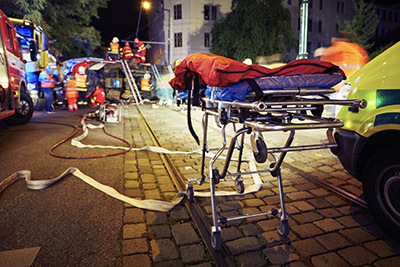 Additionally, for those people like first responders who know they will be experiencing repeated traumas, seeking professional support before the symptoms arise can be beneficial to help them to more effectively manage the impacts of trauma.